So what do you do when you want an "L" shaped desk but you are cheap? You make one out of two doors. Here is how I made mine. Here are the supplies I used and about how much I spent. My bookshelf and table legs were all 29" tall, so we obviously mounted the board so that the top of it was at a height of 29". 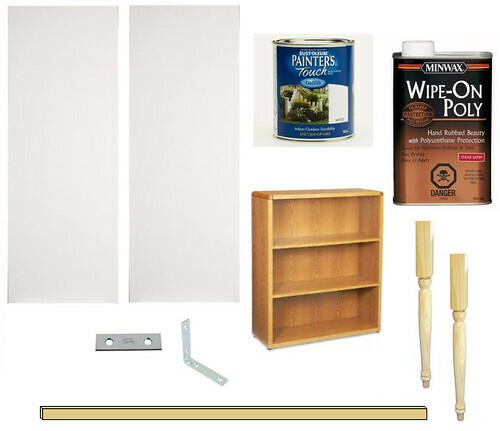 Before you start to put together the rest of the components, paint everything white. 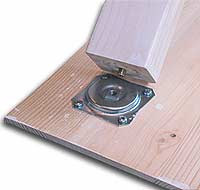 Next attach the two table legs to one side of a door. I didn't take a picture but it looked like this, thanks Google. Then it's simply a matter of setting the doors onto their various supporting elements. One door is supported by the bookshelf on one end, and the wood board on the other. The other door is supported by the two legs on one side, and the board on the other. We used a little wood glue on top of the wall board and on top of the bookshelf to keep the doors from sliding. Then connect everything together with the brackets and drill a hole where you want your computer cord. Finally I wiped on two coats of clear polyurethane after it was all put together. Done and done my friends. Now you're all very sick of my office. I'll talk about something else tomorrow I prom prom promise. I love it! This is such a great idea! k shut up you are amazing. i absolutely love this. your whole office is perfect. this door desk is super duper. wish i had a spot in my house to do this project, but alas, the kids have taken over every square inch! MUST GET BIGGER HOUSE! Is that G-ma's crappy bookshelf you painted and used at the end? You crafty clever girl. 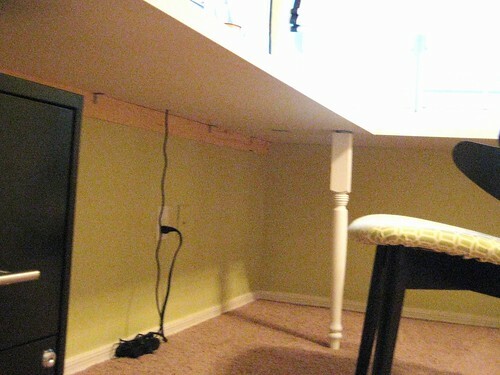 Wow, that is such a creative way to design a desk. 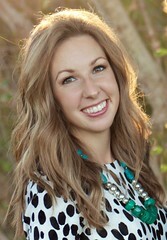 Love your new blog! Thank you for sending this link--I didn't even look at the date I was so excited to see exactly what I needed for my home office! These instructions are great--it doesn't seem too complicated. I might actually be able to do this. All I need is a free/cheapy bookshelf--time to hit up some yard sales! Thanks again. I was looking for a craft table design that's very similar to your desk design but yours being easier than what I was working out in my head. Love the desk! I have been designing something similar in my head for a while and it is great to see your example looking so nice and easily done! My question is did you use the bookshelf for design and function or for extra stability? 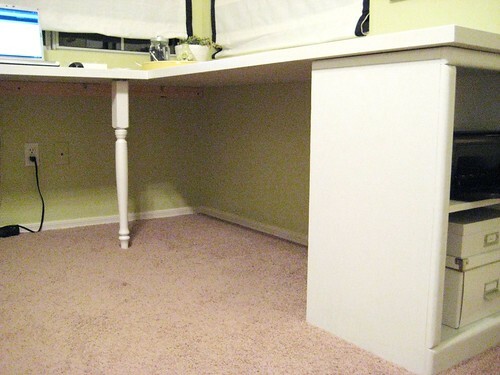 Do you think that the desk would be as sturdy by using the thin board along both walls and 3 legs instead of the shelf? Great researched articles and blog site, keep up the work! Love it! One question, how is the polyurethane holding up over the paint? Looks great! I wanted to do this and found your on google images. It looks fab!! My husband and I are in the process of making this right now! Our project totalled $196 bc we had to buy some extra wood to build a bookshelf and we are staining it instead of paint so we had to buy the wood conditioner. But I still consider that SUPER affordable to redo our entire office space. I'll keep you posted. Things are looking great so far. 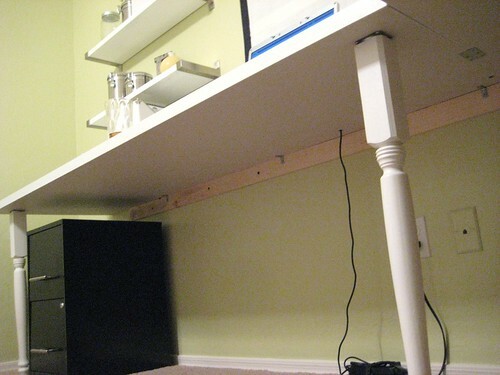 THIS DIY L DESK IS AMAZING! VERY CREATIVE!So happy I found this! We have been trying to save for an L desk for a couple months. But they are so expensive and we keep finding others things as first time home buyers, that we need more than to spend $250. OR MORE on an L desk. I'm wanting to turn my attic into an office/workroom for my photography: going pro. This would be fabulous for a place to work on photos; matting, etc. Thank you so much for sharing. When you mounted the board to the wall, how did you do it? I would love to do this but plan on using this room as a second bedroom (or nursery) when I need it.... Will it leave marks on the wall?